← “What Am I?” and “What Is God?” Answer the First Question and You’ll Answer the Second. Congratulations! You are about to receive a great gift, a virtual initiation into higher consciousness! You are about to have Thanksgiving Dinner! (Please save this and apply it to Christmas, New Years Eve, dot dot dot…; if you are outside the U.S. of course, apply this accordingly!) That means you will have to mix with some people you don’t particularly like or even possibly respect at a human level. But we are asked by God to go a bit higher than our superficial responses. We are asked to raise our consciousness to the point of seeing the Christ (Highest) Consciousness in every being, even our closest relatives, despite all outward appearances! 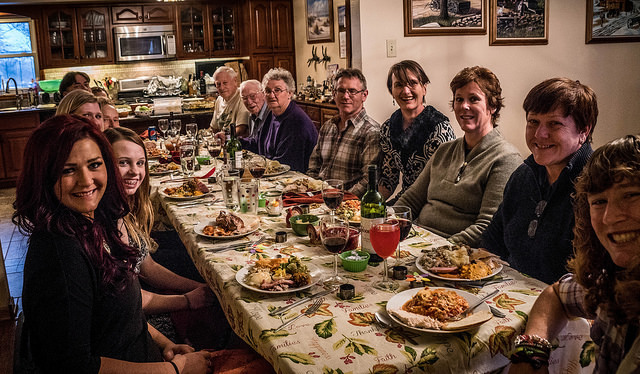 Now the people depicted here at this Thanksgiving dinner seem very friendly, but some of our individual conversations this Thanksgiving may fall short of our expectations. “But David, they are so annoying!” That may be, but if we resign ourselves to the higher understanding that everything “out there” in our world is there for the purposes of either A) Raising our consciousness to the place of unconditional love or B) Being enjoyed, then we can realign our intentions for Thanksgiving Dinner. Realize also that they as usual “Know not what they do!” in saying the dumb things they say. Most of the crazy hurtful things that are said by human beings in any situation are coming from mental programs derived from their upbringing (brainwashing by their parents), or from their own unfortunate experiences that they then carry into the present moment. They are defending themselves from past hurts by being on the offense with YOU, the unsuspecting bystander. It’s a test of our consciousness. I will forgive each person at Thanksgiving Dinner their entire past and speak with each person from a renewed point of view – the view from my own center, my own Christ Consciousness. I will speak only loving things to all those in attendance. The expression is “fake it until you make it,” if that is the best you can do. By holding our tongue even when irritated to the point of exploding at our dear relative, we will raise our own consciousness. If you truly need to speak truth to them in response to a callous remark, let it come from a loving place. Get a bit quiet inside first, and then speak. There is a choice. Will you let THEM win by dragging you DOWN into lower consciousness or will you just say something like, “I don’t agree with your point of view, but let’s leave it there?” Then walk away for a bit. They don’t have to be your conversation partner for the entire event, just so you can test yourself more! Being respectful and seeing the Christ Consciousness in everyone at our Thanksgiving dinner is all we are called to do. From our center, we will say more or less according to our intuitive guidance. If you “get into it” with the less than fully pleasant relative of yours, you are falling for the trap set for you to help you raise your consciousness – if you side step that trap. I’ve shared this before, but it’s worth repeating here. Ask yourself “UP or DOWN?” Up means you allow them to be who they are despite what they say or do (within limits of course), and you decide to stay “high in consciousness.” DOWN means you play THEIR game and let them win in fact, because most irritating souls love it when you engage with them. The lack of a fight is very disarming to them. Try it. Do the actual experiment and see which route requires more energy: 1. The fight OR 2. The decision to love their Christ Consciousness despite their obviously unkind outward speech or behavior. The “out” you have is that there is never a time where you need to stay in a situation where you are being abused at a level that is unacceptable to you. Try to raise that threshold a bit if you can, but love does not mean being run over by people without boundaries of any kind. Set verbal boundaries if needed, but initially you may want to try the internal approach mentioned above. Leaving the event is of course a defensible option, but do it with love in your heart as best you can manage that. For most of us, the challenges at these dinners are much more subtle. Practice loving those attending the event from the inside out and see how that feels compared to the long and loud debates you may have experienced during prior Thanksgivings! Expect the very best from ALL of those at the event! Setting that strong intention will tend to bring the best out of everyone. Knowing how you intend to behave IF a response is required is what we’ve discussed. Go in ALLOWING that everything will go well. May you also enjoy the meal in gratitude for the loving hands who prepared it, derived from the loving source of all things, including sustenance, abundance, loving relationships, and health. This entry was posted in Family, forgiveness, full realization, presence, relationships, Unconditional love and tagged family conflict, family debates, forgiveness, higher consciousness, live in presence, presence, present moment, raise consciousness, reliving the past, Thanksgiving, Thanksgiving dinner, transcendence, unconditional love. Bookmark the permalink.